According to statistics, at least 30 million people in the U.S. are affected by an eating disorder. An eating disorder is a psychological illness that impacts an individual’s relationship with food, typically producing irregular eating habits. The most prevalent eating disorders include anorexia nervosa, bulimia nervosa, and binge eating disorder. These illnesses commonly affect individuals who have low self-worth and are very critical of their bodies. These individuals starve themselves, or they consume a certain amount of food and disgorge it later. 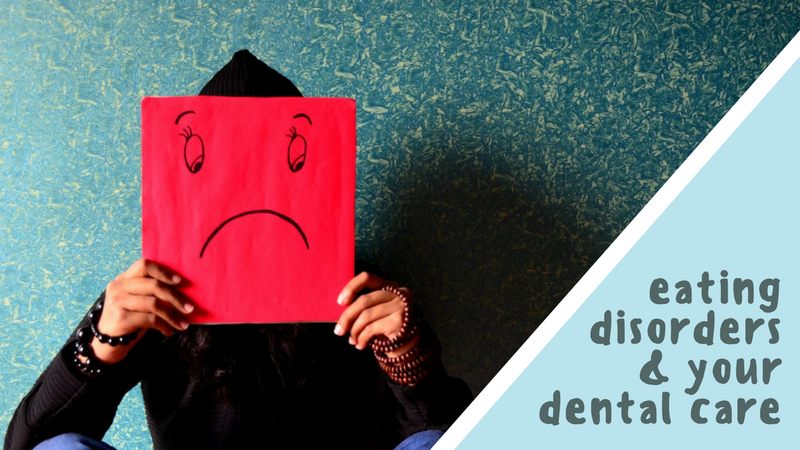 Dental complications from eating disorders can result from persistent vomiting and their oral health takes a serious hit, including tooth decay and many other ailments. Nutritional deficiencies also present visible signs of poor oral health. Dental complications from eating disorders can occur from insufficient food consumption can cause gums to swell and bleed more easily, generally stemming from a lack of calcium and other much-needed nutrients. Swollen salivary glands are also a consequence of eating disorders. This occurs due to persistent vomiting, causing these glands to become enlarged. Continuous vomiting causes the acid from the inside of the stomach to continually run over teeth. The frequent contact of acid with teeth leads to deterioration and the breaking down of the tooth’s enamel. Tooth enamel is essential to the protection of internal elements and the color of teeth. The result is discoloration, abnormal shape, translucent appearance, and tooth weakness. In some instances, the teeth break apart, causing extensive damage, which can lead to the exposure of pulp and infections. Furthermore, not eating or purging persistently to rid the body of food causes deficiencies in the body. A lack of essential vitamins and nutrients, such as iron and Vitamin B3, cause severe sores in the mouth as well as bad breath. Related Article: How Do I Stop Bad Breath? Refusing to eat or purging can also lead to dehydration as the body loses more fluid than is consumed. Dehydration can lead to dry mouth and subsequent issues. This condition can lead to tooth decay, gum disease, sores, and cracked lips. Another issue that transpires from purging is soft palate damage. The soft palate is the upper portion of the mouth, which becomes sensitive to abrasions and redness after the forced regurgitation of food. Here at Adam’s Dental Group, we are compassionate professionals who believe in supporting our patients. We encourage our patients to view our office as a place of security, where they can feel confident in coming to us for help if they are suffering with dental complications from eating disorders . Our goals as dental professionals are to enlighten our patients about proper oral health and to make significant strides in creating an oral routine that is conducive to their unique needs. If you are suffering from an eating disorder, and you are concerned about your dental health, we encourage you to speak to us. For more information on how we can improve your oral health, contact us. Local dentist, Travis A. Roberts and his experienced, friendly team at Adams Dental Group offer affordable family dentistry and gentle dental care in the Kansas City, KS area. We have two locations that are conveniently located and offer appointment times Monday through Friday to meet your needs. At Adams Dental Group, we provide most dental services, from family and general dentistry to restorative procedures, including dental implants, dentures, endodontic or root canal treatment, teeth whitening, cosmetic dentistry and much more. We accept most dental insurance plans and offer affordable financial solutions for any budget. Call us at our West location (913) 296-8030 or our East location (913) 621-3113 to schedule an appointment.